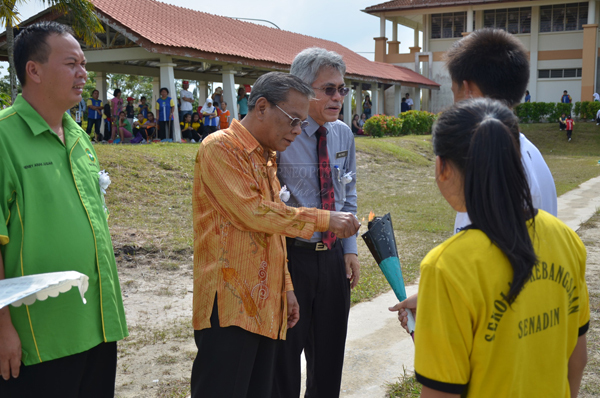 LET THE GAMES BEGIN : Gramong (centre) lighting the torch to mark the launching of SK Senadin 8th Athletic Meet, witnessed by Wilfred (right) and Henry. MIRI: SK Senadin is on the right track towards becoming a sport powerhouse as it has produced a number of athletes with high potential. This was pointed out by the Assistant Minister of Tourism and Assistant Minister of Land Development Datuk Gramong Juna in his address during the launching of SK Senadin 8th Inter-house Athletic Meet held at the school field yesterday. Also present was SK Senadin headmaster Wilfred Mac and deputy chairman of SK Senadin Parent-Teacher Association (PTA), Henry Jugah. “I was told that SK Senadin is outstanding in sport and co-curriculum. Keep up the good reputation and continue to build on that. The school is a sport powerhouse in the making,” he said. According to Gramong, it is good for students to be active in sports and co-curriculum as every student needed to be balanced intellectually, spiritually and physically. Among others, he said through co-curriculum activities teachers can instil leadership qualities in the students and help to shape them into good future leaders. “Good leadership skills should be instilled at young age and this can happen through the students’ active participation in co-curriculum activities,” he said. He added that co-curriculum activities also help promote unity among students of various races and this is one of the vital elements for a peaceful and harmonious country. “The school plays proactive roles in providing opportunities for the students to develop their mind and equip themselves with the needed skills to face challenges in the future. “Therefore, teachers are not only seen as educators but they also act as the parents, guardians and friends of the students in a school community,” Gramong pointed out. At the same function, he also announced a RM10,000 allocation for construction of SK Senadin’s permanent stage and rostrum. Meanwhile, five sport houses of SK Senadin took part in the athletic meets to scout for potential athletes for Miri inter-schools’ athletic meet which will be held in Feb next year. SK Senadin has been winning the Miri inter-school athletic meet for two consecutive years since 2012 and the school plans to retain the title next year to enable them to keep the Datuk Lee Kim Shin challenge trophy for good.